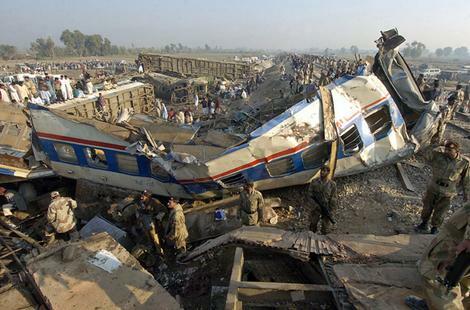 Pakistan Railways is a major national security challenge…. Central Asian Khanates and states, rich in mineral deposits like oil, gas and uranium have always been an object of great interest for the super powers. In the 19th century, Britain and Russia fought a war of shadows to extend their sphere of influence to this region. The war of shadows was later called as The Great Game by the British and Tournament of Shadows by Russia. It was the strategic rivalry and conflict between the British Empire and the Russian Empire for supremacy in Central Asia. The classic Great Game period is generally regarded as running approximately from the Russo-Persian Treaty of 1813 to the Anglo-Russian Convention of 1907. A second, less intensive phase followed the Bolshevik Revolution of 1917. The Great Game ended as the United Kingdom entered the post-WW2 post-colonial period. The term “The Great Game” is usually attributed to Arthur Conolly (1807–1842), an intelligence officer of the British East India Company‘s Sixth Bengal Light Cavalry. It was introduced into mainstream consciousness by British novelist Rudyard Kipling in his novel Kim (1901). The Russians won the first round of the tournament when they successfully brought their railroad system up to Central Asia and were practically threatening Afghanistan, the Northern access to British Empire in India. The railway line brought about a revolution in the Game and gave Russians a strategic advantage as they could transport massive bodies of troops into Central Asia. The Russian railroad system was, therefore, the major factor and force-multiplier for the Russians to occupy Central Asian states. This advantage forced the British Empire to follow suit and reach Afghanistan through railroad system. The railway lines laid from rest of India up to Peshawar and Torkhum were, therefore, not for commercial purposes but for strategic compulsions. British decisions were not prompt and were driven by commercial gains as the purse in British India was in the hands of traders represented by East India Company. Apparently, the idea of a rail network was first conceived in 1847, with the possibility of Karachi becoming a major seaport. Sir Henry Edward Frere, who was appointed as the Commissioner of Sindh, sought permission from Lord Dalhousie to begin a survey for a Karachi Seaport and a survey for a railway line in 1858. The proposed railway line would be laid from Karachi (city) to Kotri. A steamboat service on the Indus and Chenab rivers would connect Kotri to Multan and from there another railway line would be laid to Lahore and beyond. By 1886, there were four railway companies operating in what would become Pakistan. The Scinde (Sindh) Railways, Indian Flotilla Company, Punjab Railway and Delhi Railways. These were amalgamated into the Scinde, Punjab & Delhi Railways Company and purchased by the Secretary of State for India in 1885, and in January 1886 formed the North Western State Railways, which was later on renamed as North Western Railway (NWR). This would eventually become Pakistan Railways in 1947. Long after Russian railroad network into Central Asia, it was the year 1857 when the idea was suggested by William Andrew (Chairman of Scinde, Punjab and Delhi Railway) that the railways to the Bolan Pass would have strategic role in responding to any threat by Russia. During the second Afghan War (1878–80) between Britain and Afghanistan, a new urgency was needed to construct a Railway line up to Quetta in order to get easier access to the frontier. On 18 September 1879, under the orders of Viceroy Council, work began on laying the railway tracks and after four months the first 215 km of line from Ruk to Sibi was completed and become operational in January 1880. Beyond Sibi the terrain was very difficult. After immense difficulties and harsh weather conditions, it was March 1887 when the railway line of over 320 km long finally reached Quetta. By 1898, as the network began to grow, another proposed railway line was in the works from Peshawar to Karachi. It closely followed the route taken by Alexander The Great and his army while marching through the Hindu Kush to the Arabian Sea. During the early 20th century, railway lines were also laid down between Peshawar and Rawalpindi and Rawalpindi to Lahore. Different sections on the existing main line from Peshawar and branch lines were constructed in the last quarter of 19th century and early 20th century. In 1947, at the time of independence, 3,133 route kilometers (1,947 mi) of North Western Railways were transferred to India, leaving 8,122 route kilometers (5,048 mi) to Pakistan. Of this 6,880 route kilometers (4,280 mi) were Broad gauge, 506 kilometers (314 mi) were Metre gauge, and 736 kilometers (457 mi) were Narrow gauge. In 1954, the railway line was extended to Mardan and Charsada, and in 1956 the Jacobabad–Kashmore 2 ft 6 in (762 mm) gauge line was converted intobroad gauge. In 1961, the Pakistani portion of North Western Railways was renamed Pakistan Railways. The Kot Adu–Kashmore line was constructed between 1969 and 1973 providing an alternative route from Karachi to northern Pakistan. Pakistan Railways of today is effectively a relic of The Great Game and is being treated as a colonial legacy notwithstanding the fact that it is the only railroad corporation operating under the government provides an important mode of transportation throughout Pakistan. It is commonly referred to as the “life line of the country”, by aiding in large-scale movement of people and freight throughout Pakistan. It becomes a life line for the military in the event of a war. It is thus a very crucial defense infrastructure. Rest of the world has learned lessons that no land force can sustain the pressure of wars without a functional railway system. During the Great War, the US government established a Railway War Board, which later became the Railroad Administration, but so congested did the railroads become that the government eventually seized and ran them through the Railroad Administration. Under its Railroads and Highways for National Defense program, DOD, with the support of the Department of Transportation (DOT), ensures the Nation’s rail and highway infrastructure can support defense emergencies. The military places heavy and direct reliance on railroads to integrate bases and connect installations to predominantly maritime ports of embarkation. Mainlines, connectors, and clearance lines must all combine to support movement of heavy and/or oversized equipment. To ensure that military needs are factored into railroad industry decisions that may impact on national defense, the Department of Defense relies on the Military Traffic Management Command (MTMC). In this capacity, MTMC identifies facilities of the railroad infrastructure important to national defense, informs the commercial and civil sectors of Defense needs, and encourages the retention and upkeep of railroad assets vital to support military movements. To ensure this continuity and coordination, MTMC has created the Strategic Rail Corridor Network (STRACNET). STRACNET has identified 32,500 miles of rail line critical for movement of essential military equipment to ports located around the country as well as another 5,000 miles of track essential to connect one facility to another. In addition to identifying key lines and facilities, MTMC also conducts analysis of potential railroad industry construction, mergers, bankruptcies, and abandonments to determine how any of these actions may affect DOD mobility capabilities. Since 1976, MTMC has reviewed more than 2,100 abandonments affecting 33,000 miles of track, as well as eight bankruptcies affecting more 1/3 of the nation’s railroad network. MTMC analysis and reviews are the main source of DOD input to the railroad industry in attempts to preclude the loss of a critical section of track or facility that is essential to effective movement of heavy military lift requirements. The Railroads for National Defense Program (RND) ensures the readiness capability of the national railroad network to support defense deployment and peacetime needs. The Program works to integrate defense rail needs into civil sector planning affecting the Nation’s railroad system. Rail transportation is extremely important to DOD since the predominance of our heavy and tracked vehicles will deploy by rail to seaports of embarkation. The RND Program in conjunction with the US Federal Railroad Administration (FRA), established the Strategic Rail Corridor Network (STRACNET) to ensure DOD’s minimum rail needs are identified and coordinated with appropriate transportation authorities. STRACNET is an interconnected and continuous rail line network consisting of over 38,000 miles of track serving over 170 defense installations. Indian Railways is another success story. Not only that it is a bread-winner for the national kitty, it keeps the country together. It is an instrument of national cohesion and a partner in the national defense. Contrary to this, Pakistan, despite its moderate size, has a largely dysfunctional railway system. Its military establishment has grown to become a force to reckon with but its crucial support infrastructure of railways has been destroyed by the corrupt politicians. This strategic asset starting declining in 1985, when an immature railway minister of Gen Zia’s government decided to distribute jobs to his constituents and nearly 20,000 people were stuffed without vacancies. His successor, in 1988 government of BB followed his footsteps and again in 1993, the railway minister of Nawaz Sharif who is incidentally Zardari’s railway minister of today stuffed his own people. At one point in time, there were 39000 employees in PR whose only job was to receive salary and overtime allowance. It was as a result of these measures that PR got itself into a debt trap and could not come out of it. The situation has come to pass that as of mid-2011, it was decided to stop all goods train haulage due to severe shortage of locomotives and fuel. The financially bankrupt organization, despite bailouts, has not been able to emerge out of its troubles leading to cancellation of as many as 115 railway services. The decision has left ordinary Pakistanis at the mercy of bus operators for long distance travel. As of 2011, the PR network cancelled many trains and AC services in many trains were stopped. On 29 December 2011, PR restored freight train service from Karachi to upcountry. According to Pakistan Railways own statistics, track kilometers in 1950-55 were 12,000 which came down in 2010-11 to 11755; number of locomotives was reduced from 862 to 528, coaching vehicles from 2585 to 1774, and freight wagon from 24251 to 18468. Operating expenses in 1950-55 were 67% of revenues when PR was making profits, which is now 169% of the revenues. The destruction of Pakistan’s strategic asset is not only bleeding the national resources, its present state is one of the serious threats to national security and national integrity. Its fall out on excessive overload on road network and damage to environment is incalculable. It is the time that the national security establishment takes notice of this situation and take the operations of this institution away from the blood-sucking politicos.